Wouldn’t it be great to know you’re choosing the freshest, most nutritious greens possible at the market or grocery store? As I mentioned in my last post, the same type of fruit or vegetable can vary widely in nutrition from one variety to the next. The ‘best’ choice is not always intuitive. In this post, you’ll learn 5 tips on how to select, store, and prepare the varieties that are going to give you the most flavor and nutrition. I’ll also list specific varieties to look for. This information is sourced from the fantastic book Eating on the Wild Side by Jo Robinson. Most of the people reading this have access to almost any vegetable they want 12 months of the year. This separates us from the seasonal cycles of plants and also means we are consuming vegetables and fruits that have been picked unripe and shipped across the globe. This is not optimal for nutrition or for the planet. After a long winter of eating preserved meats, roots, fruit, and herbs, traditional hunter-gathers were hungry for fresh food. The bright green plants that appear in spring are full of phytonutrients and were both food and medicine after a long winter. Recent studies show that Lamb’s quarters (Chenopodium album) for example, fights viruses and bacteria, and blocks the growth of human breast cancer cells. Another common springtime treat, Dandelion leaves have eight times the antioxidants, two times more calcium, three times more vitamin A, and five times more vitamin K and vitamin E than spinach. The flavor of wild plants is more complex and intense than anything you’ll find in the grocery store. This is attributable to bitter, sour, and astringent compounds, which give these plants their deep nutrition and medicinal qualities. As mentioned in the original post of this series, much of the medicine has been bred out of these wild plants, and we’re left with incredibly mild varieties, such as our most popular variety, Iceberg lettuce. This equates to a loss in vitamins and minerals in our diet, as well as calcium. 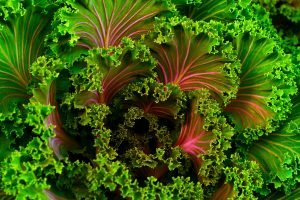 To reclaim some nutrition and flavor in our diets, and to take a step into eating on the wild side, including nutrient rich greens is a great way to begin. 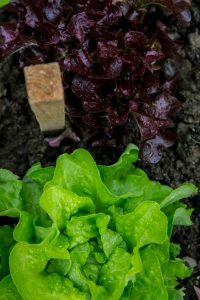 Choose the most intensely colored lettuces (preferably red, red-brown, purple or dark green) that have the loosest arrangement of leaves. The most nutritious greens have a more intense flavor. To moderate this, mix greens with a milder variety or add a fat, such as avocado or unfiltered olive oil. If buying bagged varieties, inspect them carefully, and skip over bags with yellow, brown, or withered leaves. Check the “use-by” date. Look for mixes with red or dark green leaves and choose the freshest one you can. Preserve nutrients and flavor by separating a head of lettuce into individual leaves or open a bag of loose greens and soak them in very cold water for 10 minutes. Dry in salad spinner or with a towel. Store greens in a resealable plastic bag poked with 10-20 pin-sized holes. Press the air out. seal the bag, and store in the crisper drawer. For a nutrient-dense salad, add in non lettuce varieties, such as arugula, radicchio, endive, and spinach. Find a greater (and fresher) variety of options at the farmer’s market. Take 5 minutes to make your own salad dressing. Bottled varieties often contain trans-fats, preservatives, and added sugar that would be a shame to pour over your delicious greens. For a simple, tasty, and nutritious dressing, toss your greens in some good olive oil, fresh squeezed lemon juice, and a dash of salt and pepper. Or search the Internet for easy home-made salad dressing. With a bit of attention to variety selection, storage, and preparation, your salads can be more flavorful and nutritious than ever before! Keep an eye out for the next post in this series about alliums (onions, garlic, shallots, leeks, etc) and how to choose for optimal flavor and nutrition. To tasty salads and good health! We’re all familiar with the advice to eat more fruits and vegetables. What we also need to know is which fruits and vegetables to eat to get the most benefits from our food. This is the first post in a series on how to choose fruits and vegetables with the most nutrients, flavor and freshness. 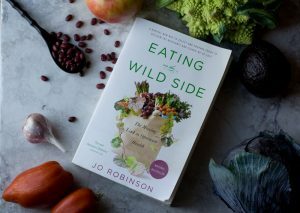 A while back I picked up an excellent book titled Eating on the Wild Side by Jo Robinson. Robinson details how to select, store, and prepare foods to reclaim the nutrients and flavor we’ve lost through decades of breeding fruits and veggies to be more palatable. Much of what I’ll share in this series is directly sourced from or inspired by her book. It’s a valuable resource which I highly recommend you purchase from your local bookstore. Aren’t all fruits and vegetables basically the same? An apple is not an apple. A tomato is not a tomato. 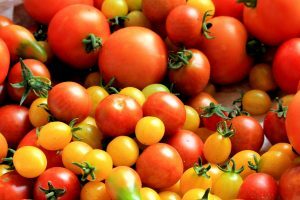 One tomato on the supermarket table, for instance, can have ten times the amount of nutrients as the next. How can we know which to select to get the most nutrients and flavor? More on that to come. There is also a common belief that heirloom varieties are superior in nutrition to modern fruits and veggies, but this is not always true. For example, the Golden Delicious apple, a 100 year heirloom, has half the nutrients of the Liberty apple, which was released 75 years later. Heirloom crops have a variety of other advantages which I will not go into here, but choosing heirlooms is not always a guarantee of superior nutrition, which is our current focus. As our ancestors began to take cuttings of wild plants to grow in gardens, they selected varieties that were tender, low in bitterness and astringency, and high in sugar, starch, or oil. Plants that were tough, seedy, bitter, or in any other way unpleasant to eat were left behind in the wilderness. This transformation of our native plants into our supermarket varieties has resulted in the loss of vitamins, minerals, protein, fiber, and healthful fats. Some of the varieties in our supermarkets are so low in nutrients and high in sugar that they actually contribute to health issues rather than alleviate them. The ancestor to the banana, for example, is a fruit which comes in many different shapes, colors, and sizes. It’s full of hard seeds, and has a peel which is so thick and firm that it must be peeled with a knife. Thousands of years of selecting for certain traits has yielded the Cavendish banana, the variety we see in our supermarkets, with sweet and soft flesh, nearly non-existent seeds, and a peel that comes off easily. Most nutrition experts agree that a healthy diet is high in fiber and low in sugar. Keeping our blood sugar at optimum levels is linked to a reduced risk of cancer, cardiovascular disease, chronic inflammation, obesity, and diabetes-the primary ailments of modern civilization. 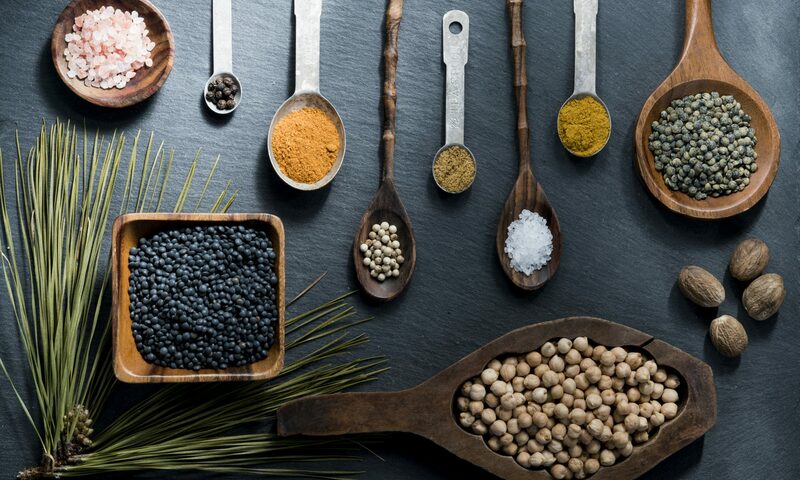 With the shift in our diet from wild foods to an industrialized food system, we’ve not only experienced a loss in nutrition, but also in flavor. Every aspect of farming has become mechanized and produce now spends days or weeks in transport and storage before it is eaten. This results in fewer nutritients, picking before ripeness, and higher acidity and bitterness. Phytonutrients are the substances plants produce to protect themselves from insects, disease, UV light, weather, and animals. These phytonutrients are antioxidants for our bodies. Among the many potential health benefits of consuming plants with high amounts of phytonutrients is the protection we get from free radicals, which can inflame our artery linings, turn normal cells cancerous, damage our eyesight, and intensify aging. Wild plants contain the highest levels of phytonutrients, and therefore, nutrition and flavor. It’s not likely that most modern humans are going to hunt and forage for most of their food. What we can do though is learn how to select the freshest, most nutrient dense varieties that are available to us at markets. How you store, prepare, and cook your produce will also impact nutrition and flavor. You can reduce, maintain, or enhance their flavor. Cooking techniques change the bioavailability (ability to be absorbed by our bodies) of certain nutrients. Potatoes, for example, can be stored for months without impacting their nutrition, while broccoli begins to lose it’s cancer-fighting compounds within 24 hours of picking. Simmering tomatoes for hours, as in traditional Italian sauces, not only enhances flavor, but triples it’s lycopene content. As the title of Robinson’s books states, we can learn to eat on the wild side. We can learn which varieties to select for optimal nutrition, flavor and freshness. We can learn how to use them. The part of my brain which enjoys trying to optimize everything loves to know that I’m getting the most nutritional bang for my buck. Knowing how to select for optimal freshness, flavor, and nutrition reassures me that I’m spending my hard-earned money on the best available option. Each post in the remainder of this series will focus on a different group of vegetables or fruits. I will name specific varieties that Robinson discovered through researching thousands of studies in the US and abroad. I will detail simple storage and cooking techniques that enhance nutrition and flavor. As in the famous Hippocrates saying, discover how food as medicine can truly become a daily practice.